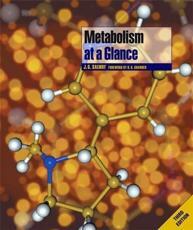 "Metabolism at a Glance" is a complete review course of metabolism in health and disease and offers a unique approach to the study of this difficult discipline. Metabolism is a complicated subject involving complex molecules and interrelated pathways. These metabolic pathways are usually taught separately with the result that the student develops a detailed but compartmentalised approach to metabolism and frequently fails to see the overall picture and its physiological significance. Using the at a glance format, the book takes the student through a complete course in intermediary metabolism in an integrated manner. The same chart is repeated throughout the book with the individual pathway under study highlighted. The book is an ideal text for introductory biochemistry courses and has established itself as an enormously popular book amongst lecturers and students alike. This third edition is fully updated and includes five new chapters: Metabolic Channelling, Glucose homeostasis and Reye's Disease, Pentose phosphate pathway and the prodcution of NADPH, Tryptophan metabolism in health and disease, and Tyrosine metabolism in health and disease.